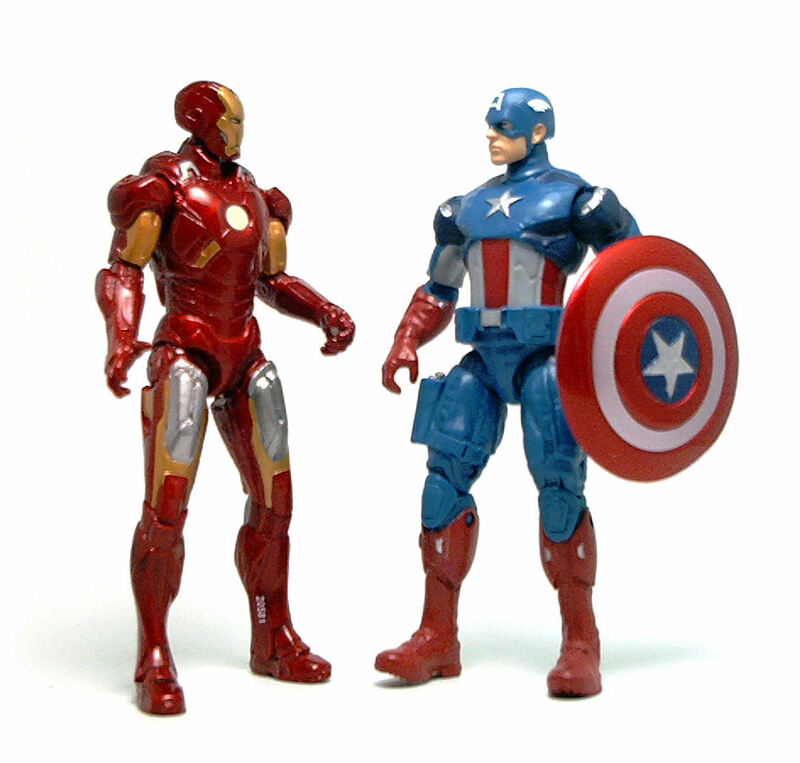 Well, when the Avengers figure line started to show up at stores, I admit I was one of those bemoaning the diminished articulation Hasbro gave to these figures. However, after being exposed to the movie in theaters a couple of times, I convinced myself that I really wanted a figure from this line and since I didn’t buy heavily into last year’s Captain America: The First Avenger line, I decided to give Shield Launcher Captain America (04) a try. 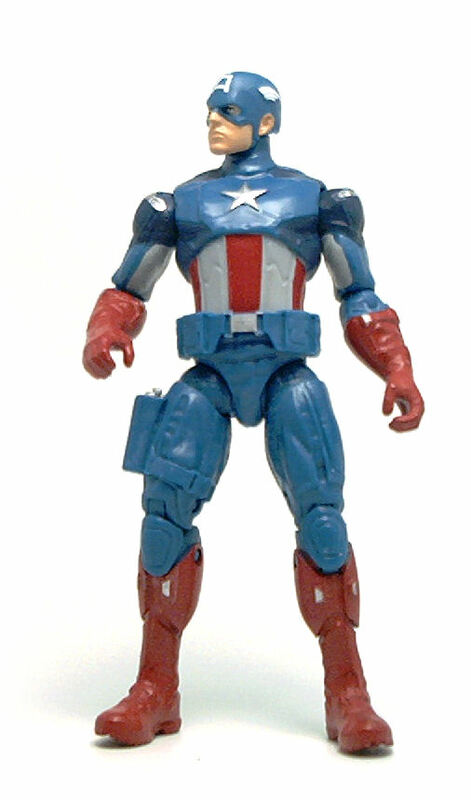 This figure is from the Movie Series segment, so he is wearing the modern day uniform developed for the Avengers movie. I must say I like the overall look, even though the suit looks a bit too much like a high-tech sports suit rather than a super-soldier garb. There is a good amount of sculpted detail in the uniform in the form of straps, pouches and reinforced panels, but no textures whatsoever. The facial sculpt is actually very good, as it is fairly easy to identify actor Chris Evans’ likeness even under the mask. 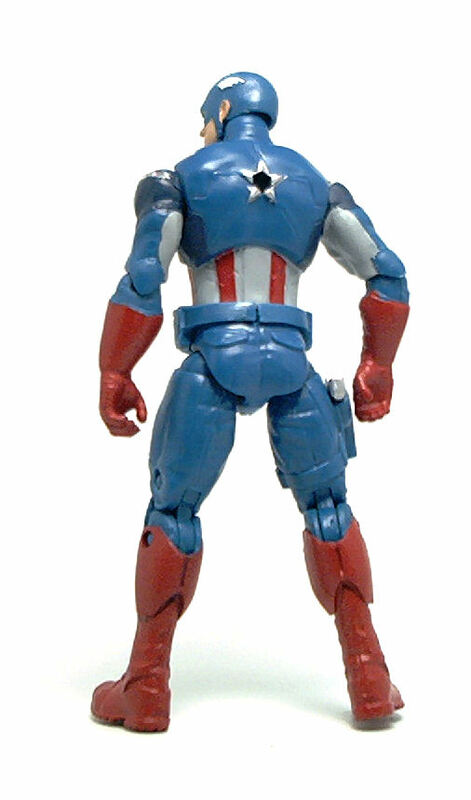 However, it is also obvious that this is a figure that entered production before the cowl design was finalized, because in the movie, Captain America has his ears covered, and this figure has the ears exposed. And that’s it. Gone are the wrists, the ankles and the waist. Of these, the ones I miss the most are the wrists, but other than that I have to concede that this is probably more than enough articulation for play and/or display. The upside is that this Captain America figure feels very stable and also very durable. All of the joints are tight and unlike last year’s figures, I don’t fear I’ll snap a joint if I inadvertently try to bend it the wrong way. In fact, the way Hasbro implemented the hip articulation this time is much more robust and more aesthetically pleasing than anything they had used for the Marvel movie lines since the X-Men Origins: Wolverine figures. 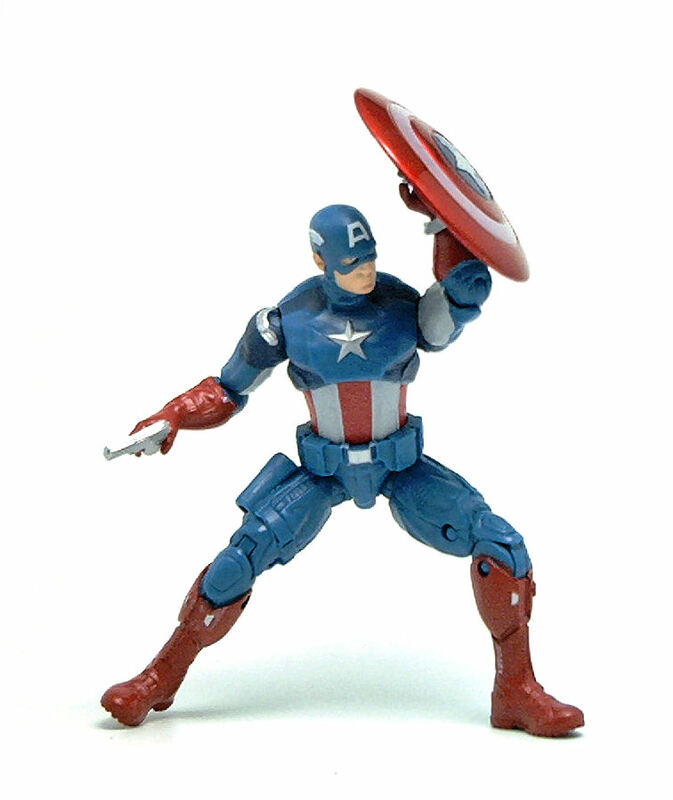 This Captain America is molded in medium blue plastic, but has darker blue panels painted at the shoulders and the side, with dark red stripes on the abdomen, as well as the boots and the gloves. Instead of going for stark white for the torso stripes and the inner side of the arms, these areas are painted in a light gray hue for a more subdued appearance, although the wings and the big A on his head are painted bright white. The exposed skin areas on the head are painted simply in flesh color, with a neatly applied two-color paint-job on the eyes. There is also a good deal of smaller details picked out in silver, like the gear buckles and the star at the center of his chest, all applied precisely enough for mass-market fare. 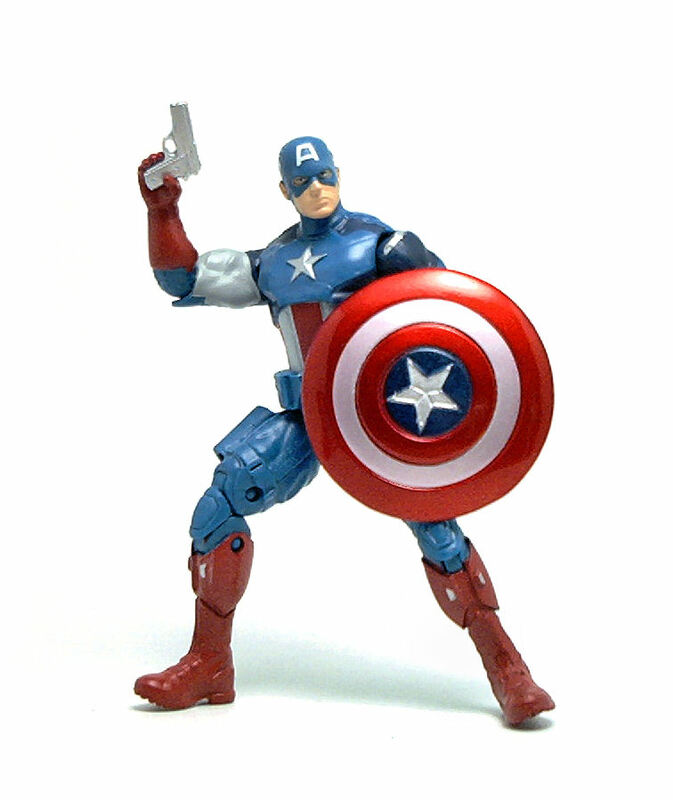 This time, Captain america comes armed with a silver pistol that fits into a holster sculpted onto his right thigh, a shield, a shield-shaped projectile and a launcher for the last one. 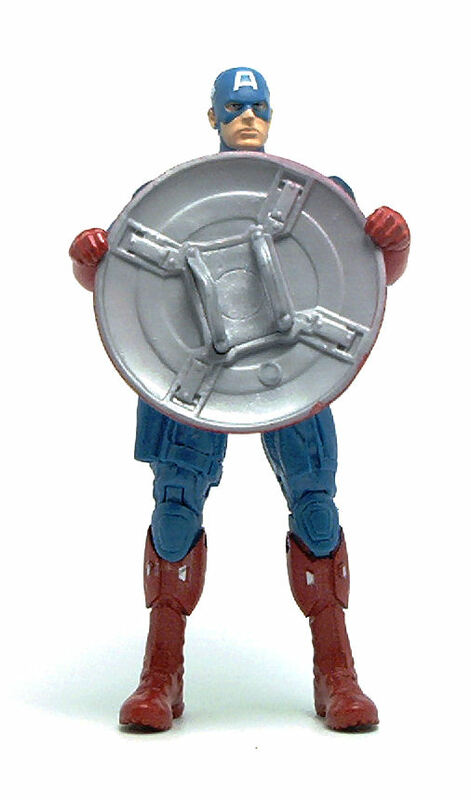 The regular shield seems to be the same mold that was used for the Super Combat Captain America figure from last year, which in my opinion is the best accessory of this type released by Hasbro. The inner surface is simply the color of the silvery gray plastic used to mold this piece, but the outer surface is painted really nice in colored metallic paints and given a high-gloss finish. 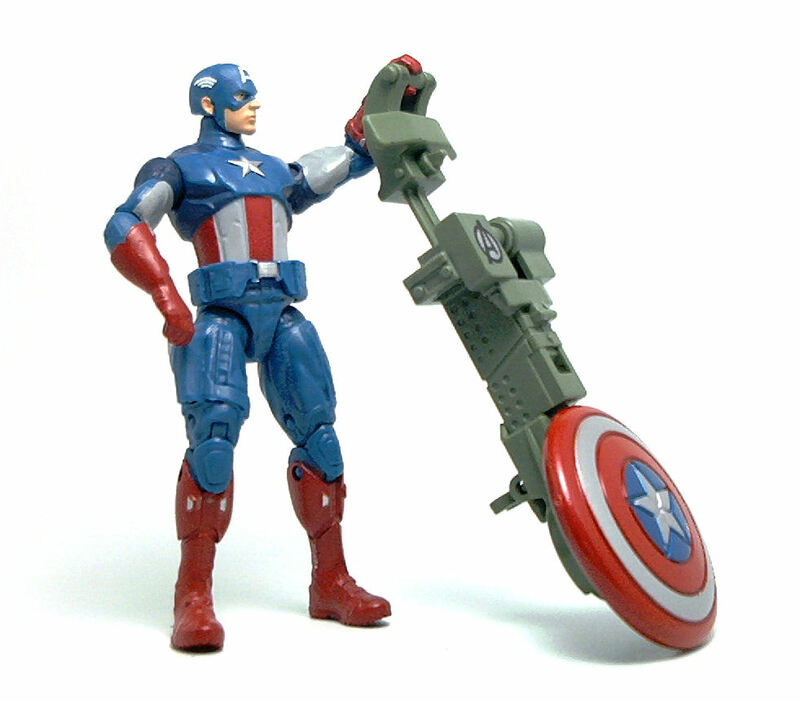 The launching shield accessory included (from which this figure takes it’s name) is painted in a similar way, although the inner part is molded to fit into the Shield Launcher gizmo and is molded in the same olive green plastic as the launcher. The whole contraption is bulky and ugly, but it does launch with enough force and precision to topple a figure standing a couple of feet away, which must count for something. In the end, while I’d still pick up a better-articulated version of this character (if it were ever released), I must say that this Captain America figure turned out much better than I expected. Great review! I haven’t brought myself to buy any of the 1:18 scale Avengers toys for the very issues you mentioned, I’d really like to have a good rendition of Cap and from what I can see this is the best one but the drawbacks are too much for me to pay retail, I’ll wait for clearance. Definitely not made for any preschool kids but maybe age 5 and up. I bought this for my 3 year old and it s hard to use at his age. Of course he still loves it because it s Captain America s shield.